The start of a new year is perhaps the best time to tackle household clutter—but it’s impossible to do it all at once. Set modest, achievable goals and tackle them one at a time. The coming of a new year is a good time to tackle some of that household clutter, but it’s impossible to do it all at once. It’s best to set yourself small goals and tackle them one at a time. One of the easiest, most rewarding places to start is with the junk drawer. Every home seems to have one—it’s that place where batteries, scissors, paperclips, twine, small tools, and other oddball items gather in a tangled heap. 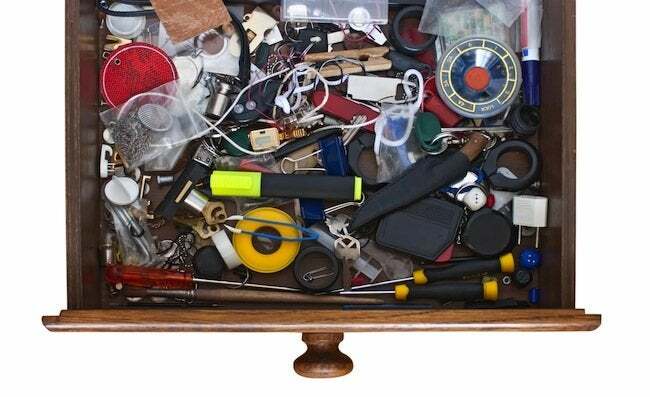 Getting your junk drawer organized can make your life much more efficient, as you’ll spend far less time rummaging for that screwdriver or safety pin when you need it. Start by pulling out the things you truly don’t need, like the chargers for cameras and phones you don’t own anymore. Set those aside for electronics recycling day. Items that are rarely used should go into deeper storage—keep handy only what you use regularly. Then sort things into categories—tools, stationery items, fasteners, whatever you need near at hand. Use a utensil drawer divider to organize your items by category as you put them away. With one drawer taken care of, you’ll be ready to start thinking about organizing the garage!